April 17, 2019 Tweet - "There's an assault on American energy production from the left, so I took a group of my House colleagues to an offshore oil platform 100+ miles off Louisiana's coast to see an industry that employs hundreds of thousands of people and helps maintain America's energy dominance." April 15, 2019 Tweet - "Our prayers are in Paris today, & our hearts are broken. #NotreDame holds a special place in my heart. Jennifer & I visited it on our honeymoon--we'll never forget the sense of awe we felt seeing its beauty & reflecting on its meaning for Catholics & people of all faiths. #Rebuild"
April 15, 2019 Tweet - "Good news this #TaxDay &#8594; Thanks to the Republican Tax Cuts & Jobs Act, American families and small businesses got to keep more of their hard-earned money in 2018." March 29, 2019 Tweet - "Some states allow babies who are born alive during attempted abortions to be killed outside the womb. Congress must stop this barbaric practice. That's why I'm filing a discharge petition on Tuesday to force Nancy Pelosi to allow a vote on @RepAnnWagner's bill to #EndInfanticide." March 29, 2019 Tweet - "100,000 migrants per month is a crisis. When will Democrats give up their radical, open-borders agenda and provide @realDonaldTrump with the tools needed to end the humanitarian crisis at our border and secure our communities from the flow of crime, drugs, and human trafficking?" March 29, 2019 Tweet - ". @realDonaldTrump's #USMCA will help American workers get ahead by creating new jobs, protecting our intellectual property, opening up new Canadian markets, and strengthening North American trade as we confront China. I'm proud to be working hard to get it ratified in Congress." March 27, 2019 Tweet - "You deserve to know where your representative stands on infanticide. That's why I'm filing a discharge petition on the Born Alive Act next Tuesday. Everyone should have to go on record and tell people whether or not they support this barbaric practice. #LetUsVote #EndInfanticide"
March 27, 2019 Tweet - "Today I launched the House Energy Action Team--a coalition to support all-of-the-above energy resources and combat policies like the #GreenNewDisaster. Our first action &#8594; put House Democrats on record with a discharge petition to bring the $93 trillion #GreenNewDeal to the floor." 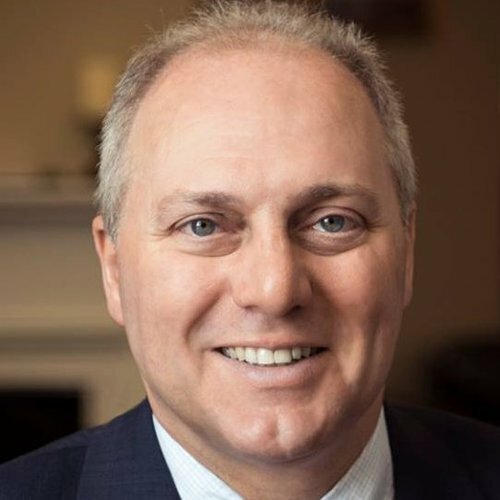 March 25, 2019 Tweet - "Steve Scalise Retweeted Donald J. Trump The Hamas rocket attacks threatening the lives of innocent Israelis reaffirm the need for our strong relationship with Israel. In the face of Democrats' anti-Israel radicalism, I'm glad @realDonaldTrump makes it clear we firmly stand behind our most important ally in the region." March 22, 2019 Tweet - "The Mueller Report cost taxpayers tens of millions of dollars & has resulted in zero indictments for collusion, proving what we've always suspected: this was a witch hunt. We deserve to know the exact cost & if those who used it to smear @realDonaldTrump will be held accountable." March 21, 2019 Tweet - "Colleges have been hostile and in some cases outright dangerous for those expressing conservative views. I'm glad @realDonaldTrump is making it clear that this goes against our values of free and open expression of ideas and won't be tolerated." March 21, 2019 Tweet - "It is past time that we recognize Israeli sovereignty over the Golan Heights. Israel faces constant threats from Iran-funded terror groups throughout the Middle East. We will always stand by Israel's right to exist, defend itself, and ensure stability in this important region." March 20, 2019 Tweet - "Together Congress and @realDonaldTrump are combatting the #OpioidCrisis. @samhsagov's latest grant announcement includes more than $6M to fight addiction and save lives in Louisiana." March 15, 2019 Tweet - "My deepest condolences and prayers are with the families of the victims senselessly killed in the Christchurch, New Zealand mosque attack. A house of worship should be a sacred place where people can feel safe practicing their faith." March 14, 2019 Tweet - "Like millions of other Americans, I feel it's long overdue for special counsel Mueller to wrap up his meandering probe and show the American people, in a transparent way, what his findings were, and also, how many tens of millions of taxpayer dollars were spent to carry this out." March 13, 2019 Tweet - "Infanticide is a barbaric practice. Yet it's legal in many states, and Democrats are trying to keep it that way. But I won't stop fighting to bring @RepAnnWagner's Born-Alive Abortion Survivors Protection Act to the House Floor for a vote." March 12, 2019 Tweet - ". @realDonaldTrump promised a secure border & a strong military. His FY2020 budget delivers that. Meanwhile, Democrats are bashing his proposal, while also saying they won't put a budget on the Floor. If you're going to criticize someone's plan, you should have a plan of your own." March 12, 2019 Tweet - "Democrats are so out of step with reality that they're blocking legislation to protect babies born alive during abortions from being left to die. I'm working to bring @RepAnnWagner's bill to the Floor so they have to tell the American people on record if they support infanticide." March 8, 2019 Tweet - "It's clear why Democrats want H.R. 1, the "Democrat Politician Protection Act," so badly. Illegal immigrants could be added to voter rolls and felons convicted of voter fraud will get the right to vote. That's outrageous, and it puts the security of our elections in jeopardy." March 7, 2019 Tweet - "Democrats claimed H.R. 1 would get money out of politics. But instead it's going to funnel billions of taxpayer dollars into the pockets of candidates and campaign consultants. How it works: if someone gives a campaign $100, the federal government will give that campaign $600." March 6, 2019 Tweet - "H.R. 1, the "Democrat Politician Protection Act" + Forces states to allow felons to vote + Overrides state voter ID laws + Removes safeguards to prevent voter fraud + Creates a system where taxpayer money funds candidates the taxpayer doesn't support"
March 6, 2019 Tweet - "H.R. 1, the "Democrat Politician Protection Act" enables voter fraud across the country by throwing out state laws that require people to show their ID and prove who they are before voting." March 5, 2019 Tweet - "Backed by the strong leadership of @RepClayHiggins, this decision will strengthen Louisiana's economy, create new jobs, and improve on our goal of American energy dominance by allowing us to supply our allies around the world with a stable source of energy." March 4, 2019 Tweet - "While Democrats are fighting to expand the abortion on demand culture they've perpetuated, Republicans are standing with President @realDonaldTrump to protect babies born alive during abortions. Read my op-ed with Senator @JimInhofe &#8595;"
March 2, 2019 Tweet - "The reality: The gun control laws Democrats passed this week to take away your rights wouldn't have stopped any of the recent mass shootings. Instead, they should focus on holding bureaucrats who failed us all by not properly enforcing the laws already on the books accountable." March 1, 2019 Tweet - "Republicans have worked with @realDonaldTrump to unleash the American economy. Job growth and wages are up. Taxes and unemployment are down. But now radical Democrat policies threaten to reverse all of this progress for hardworking American families." March 1, 2019 Tweet - "Democrats who told their constituents they're pro-life and pro-2nd Amendment are now voting for Nancy Pelosi's radical liberal agenda--stripping gun rights from law abiding citizens and allowing babies born alive during an abortion to be killed. The American people deserve better." Feb. 28, 2019 Tweet - "A new low for Democrats &#8594; By voting to make it harder for domestic violence victims to protect themselves from abusers, Democrats proved to the American people that they aren't serious about preventing gun violence and are instead just interested in pushing their liberal agenda." Feb. 27, 2019 Tweet - "I strongly oppose the gun control bills brought forward this week under the guise of background checks. Republicans identified many problems with this bill and the Democrat majority shut out almost every one of our solutions."